This week I’ve swapped out my top of the line Wear OS watch and for the incredibly cheap $29 MiBand 2. Go ahead, laugh, I’ll wait. You’re right to scoff, this device looks like a gel bracelet with a bad attitude. I honestly didn’t have very high expectations; this was going to last two days, tops. But actually I liked it! Now don’t get me wrong, this device has plenty of downsides, but this little experiment has significantly shifted what I want in a smart watch. After using it for a day I was astounded to find the battery level had gone down by just 3%. That couldn’t be right. But as I used it throughout the week that 3% drop per day continued. If this holds up, I’ll have to recharge it in 4 weeks. I’m currently on 2 week vacation and I’m not even bringing the charger with me! It’s kind of pathetic I find this so exciting but the idea of going back to daily charging with my smart watch fills me with dread. Another surprise was the weight difference. Most smart watches are between 80 and 120 grams. This band is a feather light 7 grams. It feels like nothing. Combined with the insane battery life, I just wear it all of the time: in bed, in the shower, and of course when I work out. I’m basically wearing it 24/7. This is transformative as I can now get sleep tracking data, which I could never do with my watch as it was a) always charging at night and b) far too big to sleep with. By wearing it while sleeping, I could then use the ‘silent vibrating alarm’ feature. This allows me to get up much earlier than my wife and not bother her with my alarm any more. Overall, the lesson here is the double whammy of small size and long battery life create a huge step change in how I’m able to use the device, opening up new functionality never possible before. The functionality of the device is fairly limited. It can show the time and it will vibrate when your phone receives notifications. You can choose which apps vibrate, but the small display only shows a black and white icon. However, there is an add-on app that adds the ability to scroll the notification text in addition to the icon. This isn’t great, to be sure, but in yet another surprise, I found this cheapo notification system to be nearly as effective as my smartwatch. I realize this sounds a bit counter intuitive but I was surprised how much context allowed me to decide when to ignore the notification or take out my phone. There is clearly more to explore here but my spider sense is tingling. It feels like this hyper minimal notification system is just a small refinement from greatness. I’ve been told there are three main use cases for smartwatches: health monitoring, notifications and apps. I’m firmly in the health and notifications group. I just don’t use apps on my watch. I realize this sounds sacrilegious but it wasn’t until this experiment that it became clear I want my ‘watch’ to be a powerful data generator, not an interactive screen. The MiBand has made it painfully obvious how much better my existing watch could be at health monitoring. I’ve always joked that my Wear OS watch is awesome about once a week, I just need it to be awesome more often. 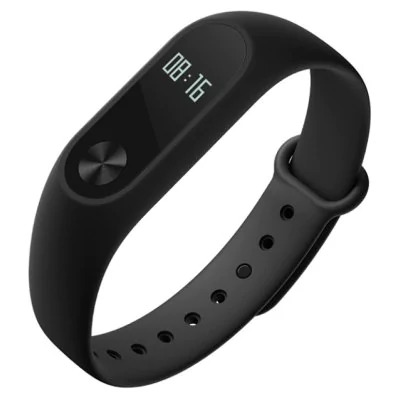 The MiBand 2 changes this calculation. With it’s nearly infinite battery life and feather light weight, the MiBand reduces the overhead of a smartwatch so much that even a single awesome event a week is now worth it. However, with it’s ability to be worn continuously it opens up entirely new health monitoring cases that make it even more valuable. Am I ready to throw my Wear OS device away for this? No, this band is just a bit TOO primitive for me. What I want is a hybrid. I’d like a thin, light weight watch with classic physical analogue hands and a modest monochrome display to get better notifications. Something closer to a thin Swatch. No touch screen but maybe two touch sensitive areas for basic yes/no choices. I’d even settle for 7 days of battery instead of 30. But a tiny little ‘health’ watch like that would win my heart forever.